I liked liver even as a child, especially with ketchup. This time I tried plating the onion and bacon in the centre, then the liver over top. The liver is too spread out and maybe there's too much so it wasn't effective. I thoroughly cooked three strips of bacon first then caramelized two onions in the bacon fat. Even thinly sliced the onions still took 20 minutes to slowly turn sweet and golden without drying to paper. While they were cooking I salted, floured the liver. The turnip was boiled for over an hour so it was completely softened, finished with butter. The mashed potatoes were finished with a little butter, milk and pinch of salt. The frozen peas were done in the microwave and finished with butter and a pinch of salt. When the onions were done I removed them from the pan and put the liver in. 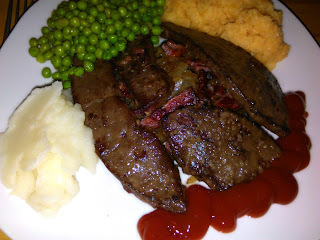 If it's thinly sliced, liver cooks really fast so everything else should be ready first. I let the peas sit in the hot water a minute too long. I cooked the potato in a little too much water so they were a touch mushy. The turnip was over cooked but still tasted good. I sliced the onion very thinly which gave a better result. I ate everything on the plate so it was good enough not to leave any.